I continue to struggle with language. It is not that I have no incentive, but the struggle is definitely an uphill task and those with whom I attempt to communicate are not helping at all. In the hills in France (patience, it is connected), when two walkers meet, the conversation follows convention, “Bonjour” is exchanged. That may be sufficient; there may be a subsequent “ça va?” If one then attempts something more, conversation proper begins, even with my awful French: the door is open for communication and the other party (thankfully) compensates for poor language skills. I have found many situations in France to be exactly as described in textbooks, at least for the first few sentences. In the parallel situation in Britain, the moment of meeting is not so predictable: I have counted twenty different greetings among forty respondents on the same day and hill. “Hello”, “nice day”, is not unexpected, but “steeper than I remember”, “you’re too fast and putting me off” don’t exactly fall into predictable patterns of speech. That makes English a difficult language on top of its other complications because of the way we use it. We make ourselves laughing stocks when abroad, for the stereotypical response to failure to use our language is to speak louder and slower (but still in English) with little regard for content, word choice or accent. I am finding that Chinese behaves much more like English than French. According to my ears and on the basis of only three weeks listening, the language uses words and phrases in many contexts. I was listening last night in Xi’an, in the Yosmite (not the Yosemite) to three friends chatting over the menu. 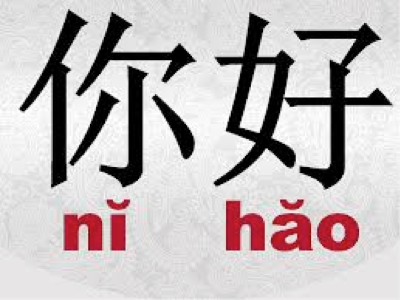 Ni hao (hello, I know that one) was used not just to each other, but to address a newly noticed menu item. The phrase doubles as good evening and hello while actually saying “you well” or “you good”. Greeting situations are formalised nicely, but we Europeans do confuse Japanese habits with Chinese. It is rare to see a bow here, but one just might put one’s hands together (as if praying, elbows tucked in to the waist) as part of a welcome. More important is the exchange of business cards (I really needed some when I came out at Easter); these are exchanged with both hands, not one. This is a dextrous movement worthy of practice; it is acceptable to use single fingers, but it is appreciated if both can exchange cards as a mutually co-ordinated exercise. The card is read before it is put away in a pocket, so it might be some time before such a moment occurs in conversation. It is an insult to handle either card with one hand apart from the moment of pocketing, so two hands should hold the card, up to and including the moments of actual reading. And (“Don’t start sentences with and, unless perhaps following speech patterns”) the Chinese are at least as unhelpful as Brits at home when it comes to dealing with foreigners. Oh, yes, we too appreciate that there is a difficulty, but neither a Brit nor a Chinese tempers their language in response. I find the language delivery no slower, but that actions are used to help. At the supermarket, when the total is rung up and the display hidden, broken or switched off, the sum is rattled off at a speed where I can just grasp that maybe a number was said. However, the ubiquitous calculator is used to display what this idiot missed and the problem passes. Of the 300 pages in my dictionary, words beginning with ‘a’ amounts to only 3 pages, ‘e’ just one; there is no ‘i’, ‘o’ is only 4 entries and there is no ‘v’ – but s to z still takes up fully 150 pages; half of the book. There are no ‘sk’, ‘sp’ or ‘st’ sounds. There are far too many sounds that to our ears are very similar. I am having problems with, in Pinyin, xï (hsee) and qï (chee) and chì (chuh) and shï (shee) and shì (shuh); I don’t grasp the difference between zha and jia easily enough. I am missing all sorts of phonemes: parts of the dictionary are unfamiliarly short, which just emphasises the differences. Thus you might agree that many of the sounds we are used to recognising are simply not extant. The demand¹ for language remains the same, so obviously the number of words in the two languages will be similar and there are sounds made here we don’t make in Europe. That doesn’t make them easy to say, or to distinguish. Adrian Chan explains that people won’t slow down because the language doesn’t sound right, because it sounds weird when slow. Well, the beginner’s only hope is in having some places where it can be weird and slow and right, or else it will remain a garbled version. You must want to communicate more than being embarrassed; the cost of not getting your message across has to be more than the social cost in making it happen. Experience says this is much easier when some of the people around understand some of your problem. I found in India, where English is the official language of government, several of the porters had poor English; they were most appreciative of patience in making conversation and it is surprising what you can do with synonyms if you free up your thinking. An equivalent exercise was practised by me at the end of my last term. You, too, can speak in words of only four letters, or avoid using words of that length. See “4-letter words”, obviously enough. The mental gymnastics feel very similar (to me) to those used in fishing for words in European languages that might have a similar word in English. I got by in Portugal for five months using this technique: bin all words with German roots, go for the words with French and Latin roots, guess how it might sound in Portuguese and try it. It’s better than not trying at all, and communication does occur. Mind, the Portuguese I met on site (I was working on building a refinery) couldn’t speak to each other in their own language, so thick were their accents and dialects (think Welsh and then multiply the problem by ten), so they tried Spanish, French and English, usually in that order. It made for an interesting time and fascinating arguments. Unfortunately, whatever English has in common with Chinese is long buried and rotted away, so one is left with hand-signals and inventive use of the pathetically few words one (thinks that) one knows. There is some lovely mathematical research that shows that in any two languages the number of sounds with very similar meaning will be much higher than you would expect. Have a look at false cognates . http://www.macmillandictionaries.com/med-magazine/April2003/06-language-interference-loan-words.htm Try MED Magazine. http://www.macmillandictionaries.com/med-magazine/July2004/21-FalseFriends-Russian.htmI I would insert a link to Wikipedia but I can’t get to it from a desk in China at the moment. Some of these – cognate homonyms? – do have historical significance, but many do not. Wo xi, wo xi, is pronounced pretty close to “woshee, woshee” and means – you guessed it – I wash. Unless you say it wrongly, when it means the bedroom. Re-reading this and doing minor edits three years later, I am not much nearer solutions to the language problems described. My vocabulary is not a lot bigger and although my ear can distinguish a greater variety of sounds I am not nearer recognising which tone means what. That is at least partly because the Chinese teachers I meet are apparently incapable of understanding the westerners’ problems. While westerners change their techniques to accommodate different learners of language, the reverse situation is not true - or not so where I can find lessons. If she is reading this, Winnie is the one exception. So I want lessons that work on the four tones by constructing sentences that demand one hears the differences; I’m looking for tongue twisters or word games that explore this. No help from anywhere; no recognition of the problem. Yet a western friend missed a joke completely because she heard the second tone and couldn’t replace it with the fourth (in her head, it is a completely different word and I’m a bit jealous of the work it takes to do that). Too many of the questions I have about language are too hard for my listeners - I am demanding too great a knowledge of the language and a speed / flexibility of thought simply not available. The equivalent position in English implies low education levels, yet all the people I deal with and might ask questions of have at least a Master’s degree. I am beginning to think its ownership is a bad measure of education. 1 Hyperlink to game site in China—and not knowingly inserted by me—at the word demand successfully eliminated on 20121007. Sorry about that; I still don’t play games and have been annoyed by this screen appearing for quite some time.